From Mayon to Calaguas Island: Bicol Escapade in 3 days! So, kumusta naman, after ng bakasyon nitong mga nakaraang linggo? For sure, eto ka ngayon, naghahanap ng susunod na holiday or long weekend. Good luck, the Holy Week is just around the corner! And if you’re looking for an adventure, why not put Mayon and Calaguas Island into your plans? Yes, it’s definitely possible to see the best of what the Bicol region has to offer in three days! Saktong-sakto para sa 2019 travel goals mo, di ba? But first, why a Bicol adventure? Kung gusto mo ng budget na biyahe na malayo sa routine mo, the Bicol region is your best bet. It’s far enough from work and home, and best of all, you don’t need to break the bank. Para kang nangibang-bansa pero hindi aaray ang wallet at budget mo. But the best reason is, why not? 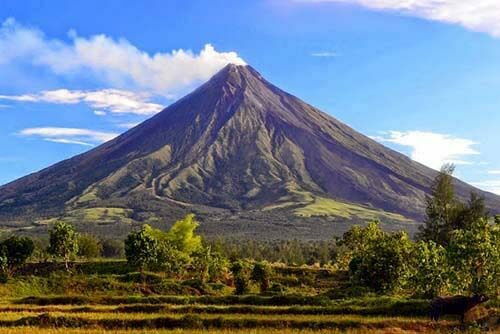 Bicol offers a lot of tourist spots and natural wonders perfect for making memories. Di lang siya maganda pang-post sa social media–may natural beauty ang mga lugar na ito para di mo makalimutan. And this is what makes the Bicol region a place worth exploring. Hindi kumpleto ang pagbisita sa Bicol kung hindi magpupugay sa Daragang Magayon! Mayon Volcano, with its perfect cone, is always a sight to behold. The best time to capture it without the clouds that block the view is at sunrise. Kung maswerte ka, you can see this perfect shape pagbaba mo ng bus sa Legazpi. Take time to explore the ruins of Cagsawa. If possible, secure an off-road ATV tour of the lava fields for an unforgettable adventure. Exploring the lava fields is a powerful reminder of what Mayon can do to change the landscape–and yes, marami nang namatay sa mga past eruptions. Just make sure to check for the volcano’s alert status before you go. Remember, there’s a 6-kilometer Permanent Danger Zone around the volcano. From appreciating the beauty of one of the natural wonders of the world, go visit the region’s spiritual heartland. Naga is the home of “Ina,” Our Lady of Peñafrancia, the patron saint of Bicolandia. While the traditional feast days are held in September, walang masama kung bumisita ka this Holy Week. 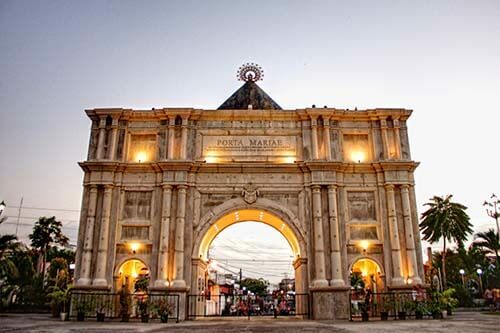 Naga City has several traditional churches and cathedrals worth visiting, as well as important landmarks such as the Porta Mariae. You can take the whole day to explore them. Kung nagmamadali ka naman, pwedeng matapos by lunchtime. From the city, you can also jump off to the nearby places of interest like CamSur Watersports Complex (CWC) or head for the beaches of Caramoan. Forget Boracay. No disrespect, pero iba talaga ang ganda ng Calaguas. Yes, the sand is white and the water is blue. But here, there are no hotels and bars that wreck the natural beauty of places like Boracay or Puerto Galera. What’s more, ang mga ngiti sa mukha ng mga taga-rito, totoo. 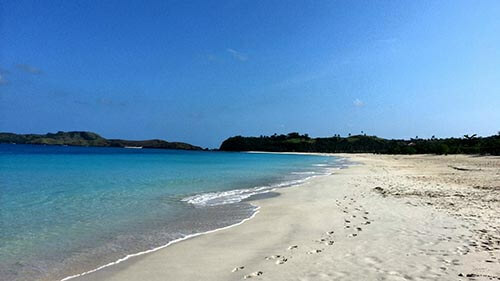 Calaguas forces you to get away from the hectic pace of your world. Walang signal, walang kuryente. Maraming oras para magtampisaw sa tubig, or mag-hiking. Oo, maraming oras para mag-pictorial para sa social media channels mo. Best of all, you get to spend time with Nature and of course, the people who matter to you. Our suggested itinerary says you can explore Calaguas Island in a day, but we recommend strongly that you stay overnight. Go island-hopping during the day, and sleep under the light of the Milky Way at night. The experience can be unforgettable. There’s so many reasons to stay; above all, social media posts can never do justice to the beauty of this place. So that’s exploring the best of what Bicol has to offer in three (or four) days. Mayon, Naga City, and Calaguas Island are just a sample, however. There’s more to discover about Bicol–but that’s a story for another day. You can find the details of this Bicol escapade here, and exploring Naga City here. You can also book your bus trip to Legazpi or Naga via Bicol Isarog (which offers really nice coach options such as De Luxe and Sleeper buses) through POSIBLE. What are you waiting for? I-book mo na ang trip mo and get ready for a new adventure to tick off your travel goals!